In the article on Deadlock Analysis and Prevention, we saw how deadlock occurs. We saw that SQL Server selects one of the processes involved in the deadlock as deadlock victim. In this article, we will look at the criteria on which SQL server selects a deadlock victim. Why one process is selected as deadlock victim and not the other. SQL Server runs a lock monitor thread every five seconds to check if any deadlocks have occurred. If a deadlock is found, a victim is selected and the interval for the lock monitor thread is reduced, this can be to as low as 100 milliseconds in some cases. If the lock monitor thread stops finding deadlocks the interval for deadlock detection is then periodically increased up to the default five seconds interval. 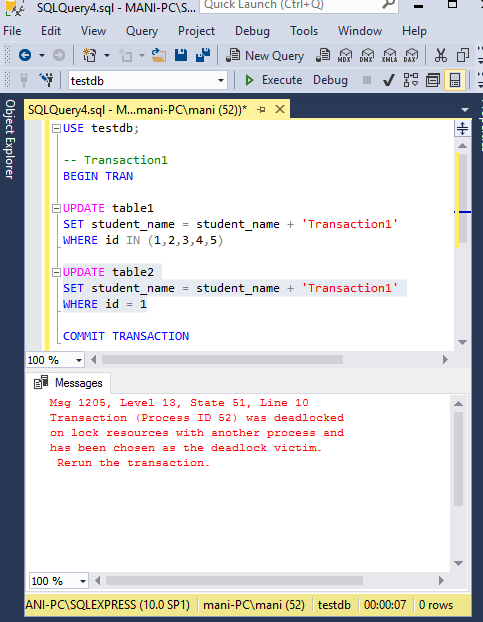 When a deadlock is detected, SQL Server then needs to select a victim of the deadlock. Once this has been done, the victim transaction is rolled back and all of the resources held by the victim are released. A 1205 error is sent to the application that was running the victim transaction. By default, SQL Server chooses as the deadlock victim the transaction that is least expensive to rollback. In simple terms, a transaction that makes the fewest changes to the database is considered the least expensive. However, users can set custom priorities for a particular transaction using the SET DEADLOCK_PRIORITY statement. The process with the lowest deadlock priority will then be the one chosen as the deadlock victim. By default the priority for all the processes is normal. It can be set to LOW, NORMAL or HIGH. It can also be set to an integer value in the range of -10 to 10. As noted earlier, the process or transaction with the lowest deadlock priority is chosen as the deadlock victim. If the priority of all the transactions involved in the deadlock is same, the transaction that is least expensive is chosen as deadlock victim. In the unlikely event that both the deadlock priority and the cost of the transactions involved in the deadlock are equal, then deadlock victim will be selected randomly. This is most easily explained by working through an example. Let’s create some dummy data. We will use this data in our deadlock example. Execute the following script on your SQL Server. First, let’s take a look at a practical example of how deadlock victims being selected based on their deadlock priority. We will run two parallel instances of SSMS. Each instance will run one transaction that will be accessing a resource locked by the other transaction. A deadlock will occur and SQL server will then select as the victim the transaction that is the least expensive to roll back. The process of creating a deadlock is simple. First execute the first update statement from the first transaction and then execute the first update statement from the second transaction. This will create locks on table1 and table2. Now execute the second update statement from transaction1. This statement tries to access table2 which is locked by transaction2. Finally, execute the second update statement in transaction2. This statement tries to access table1 which is locked and at this stage a deadlock will occur. Now we know that by default, the deadlock priority for both of the transactions is NORMAL, therefore SQL server will select that transaction as deadlock victim which is least expensive to rollback. The first UPDATE statement of transaction1, it is updating five rows of table1 whereas the first UPDATE statement of transaction2 is updating only one row in table2. This means that transaction2 is the least expensive to rollback. In the next example, we will set the deadlock priority of transaction2 to HIGH and will again create a deadlock. This time transaction1 will be selected as deadlock victim since it will have deadlock priority of NORMAL by default. Before we do that let’s clean our tables and re-insert the data into it. Again, lets run two instances of SSMS in parallel and execute two transactions in them. Now, repeat the same scenario as we did in the previous example and create a deadlock. This time you will see that transaction1 running in the first instance will be chosen as deadlock victim as shown in the following screenshot. The process with the lowest deadlock priority is set as deadlock victim. If the deadlock priority of all the processes involved in deadlock is same, then the process that is least expensive to rollback is selected as deadlock victim. If both the deadlock priority and cost of processes involved in deadlock is same, then the process a process is selected randomly as deadlock victim.